You’ve seen the Bluntman and Chronic 8″ Retro figures, you’ve seen the Jay and Silent Bob Minimates, but THIS is the first time you will be seeing the 7″ Jay & Silent Bob 20th Anniversary Select Action Figures (unless you were at Toy Fair 2014) from Diamond Select Toys. These figures were shown at DST’s booth, but no photography was allowed of them. A Diamond Select Toys Release! It’s been 20 years since we met Jay & Silent Bob in Clerks, and DST is celebrating the less-than-dynamic duo’s anniversary with their most realistic action figures ever! 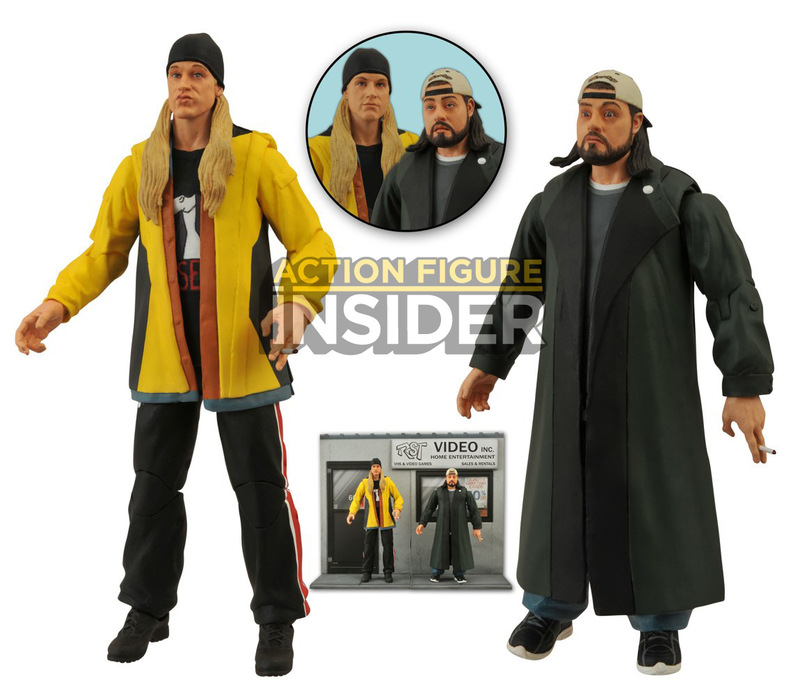 Based on their appearances in Jay & Silent Bob Strikes Back, these 7-inch scale figures include multiple interchangeable parts, multiple points of articulation, and connecting display bases depicting the interior and exterior of RST Video. Packaged in Select-style display packaging, with spine artwork. Sculpted by Patrick Piggott! Thanks to Zach and the gang at Diamond Select Toys for letting us debut these figures! You can check out our full DST 2014 showroom gallery right here!